Arthur Fletcher was born on January 5th, 1885 in Collinsville, Illinois. 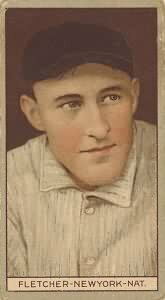 He came to the New York Giants in 1909 and after two years became their regular short stop through 1920. He was a mainstay during the John McGraw glory years, playing in four World Series with the New York Giants. He was an outstanding defensive short stop, leading the league in fielding twice (1917 & 1918) assists four times (1915/ 1917-1919), games played once (1917). He twice was considered in MVP voting & was considered in Hall of Fame votes eight times. His defensive rankings in baseball reference WAR category had him best in his league six times as well. His best year for batting average was his first full season when he hit .319 (5th in the league), he would hit over .285 three more times in his Giants career. 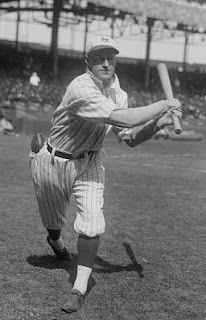 In 1916 his .286 average put him in the leagues top ten in hitting again. He drove in over 70 runs three times, and made the leagues top ten four times in that department. He had nine seasons where he hit more than 20 doubles, including 32 in 1920. It must be said he received votes for the MVP award in both 1913 & 1914. His best asset may have been his ability to get on base, by getting hit by pitches. He went on to lead the league five times in that category and came in second twice more. All time he was hit by 141 pitches putting him at number 25 on the all time list. 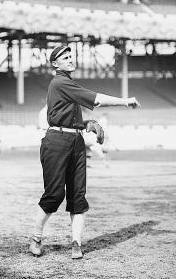 Post Season: Fletcher played in four World Series but was on the losing end all four times. In Game #3 of the 1910 World Series against the Boston Red Sox, he tied the game up with a 5th inning single off Buck O'Brien, leading the way to a 2-1 Rube Marquard victory for New York. He would drive in another run in Game #6 of that series as well. In Game #2 of the 1913 World Series against the Phialdelphia A's, he broke a tenth inning scoreless tie with a two RBI base hit off Eddie Plank. The runs secured a Giants win & Christy Mathewson shut out. He hit .191 in Series play (18-94) with seven RBIs, two stolen bases & of course one hit by pitch in 25 games played. In June 1920 he was traded to Philadelphia where spent two seasons batting .296 & .280. Retirement: After his playing days he took over as manager of the Phialdelphia Phillies and had four losing seasons. He came back to New York as a coach for the AL team across the Harlem River. He coached there for 17 seasons, and even served as interim manager for eleven games. In September of 1929 NY manager Miller Huggins went down with a tragic blood poisoning disease and Fletcher took over winning six of eleven games. Fletcher would go on to coach in ten World Series. Passing: He retired in 1945 and sadly passed away of heart attack in Los Angeles at age 65, in 1950. A baseball field was named after him in his home town of Collinsville, Illinois.